bike path, in the parking lot, by the water, and everywhere in between. 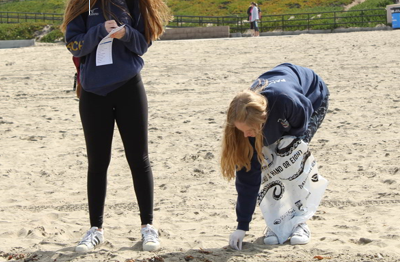 beach clean up at Torrance Beach. The clean up started at 10:00 a.m. and ended at 12:00 p.m. We searched for trash in the bushes, in the sand, by the bike path, and by the water, travelling up and down the coast. 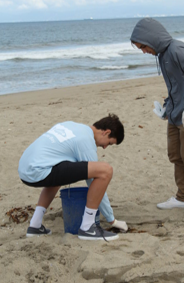 We had 25 high school students, ranging from freshmen to seniors, participate in picking up trash all along Torrance Beach. 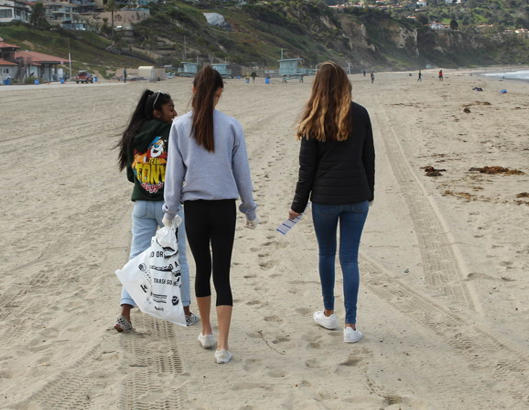 We picked up things like plastic and glass bottles, plastic straws, cigarette butts, cardboard, and so much more, including 242 miscellaneous plastic piece s.
On Earth Day, our club MKHS Heal the Bay, along with other volunteers, set off to clean Santa Monica Beach. We arrived twenty minutes before the clean up began and lined up to get registered. After registering, we met with one of the Heal the Bay members to discuss safety and ground rules for the cleanup. Once all of us had gloves, buckets and the checklist to keep track of the different types of items we would find, we were ready to go. The seven of us set out into two groups to start collecting the trash. Within the first 10 minutes, we were able to collect a few pieces of plastic as well as some bits of glass. We had even found a few zippers lying around the sand. While walking, we collected shredded pieces of styrofoam and some bottle caps. Eventually, we encountered one of the storm drains that the members had discussed about before. While the water was not high enough to connect to the drain water, it did form a small pond full of dirty water. When taking a closer look, we could find a lot of plastics, glass, and other pieces of trash lying around. We were able to collect them before heading back. Every piece of plastic, glass, or trash we found, we marked it down on the checklist. By the time we got back to starting point, we found over 50 pieces of plastics and at least 3 pieces of glass as well as a significant amount of miscellaneous materials. The other group’s data was similar to what we found. After handing the checklists over, we sorted the different materials and recyclables. Once in a while, we took a break while walking along the shoreline. Because we were wearing closed-toe shoes to protect our feet, we had to occasionally dart away from incoming waves to avoid getting them wet. Not only was it relaxing during the small break, but it also allowed us to appreciate the scenery as well. Considering the sizes of the items we found, it was quite difficult trying to pick them up with the cloth gloves. Luckily, our members brought in regular vinyl gloves to pick up the smaller bits. Plus, some of them had even brought their own plastic grabbers to reach for the more difficult items. While crouching near the ground to search for clutter lying around was not the best experience, the end result of being able to even collect small amount of trash from the environment made it worth it. 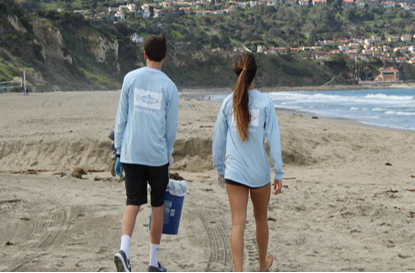 Being able to spend a nice day out on the beach doing and helping clean up the environment leaves a good feeling. 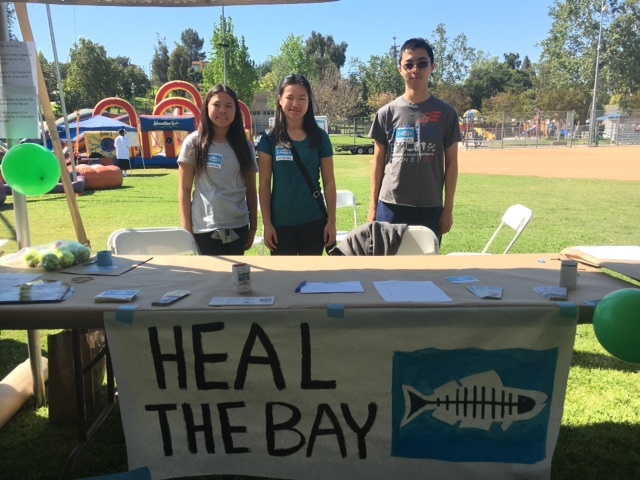 Mark Keppel High School Heal the Bay Club Tabling Event! t be in the Ocean”. The category marked “Trash that should not be in the Ocean” was a trick question because all trash thrown into that box would be valid. The project began about 6 months before Earth Day to contact the city of Monterey Park’s representatives to ask for a table at the Earth Day festival. Other environmental clubs at Mark Keppel were also collaborating for this event, so communication was key. While th at was happening, the game had to be planned. A game would entice participants to come visit the booth and would be a fun way to promote the club and Heal the Bay. Lastly, the materials for the tabling event were sent by mail, tabling shifts were filled by MKHS Heal the Bay club members, and the tabling event was ready! Strangely, a lot of participants did not realize that all the tennis balls could go in the box “Trash that should not be in the Ocean.” When volunteers told participants of this, the participants laughed at themselves for not noticing this. Some members also showed off their hand-eye coordination while playing the tossing game. One visitor who worked for the LA sanitation department shared his gratitude for our efforts and Heal the Bay’s programs. Club members and participants learned about our effects of pollution and responsible waste disposal. Club members also worked on their social and public speaking skills while talking to participants. Hopefully this tabling event will spark more eco-friendly action in Monterey Park and encourage residents to come to one of Heal the Bay’s beach cleanups. This project was a new and beneficial experience for many club members. We would definitely join another Ecosummit organization again.